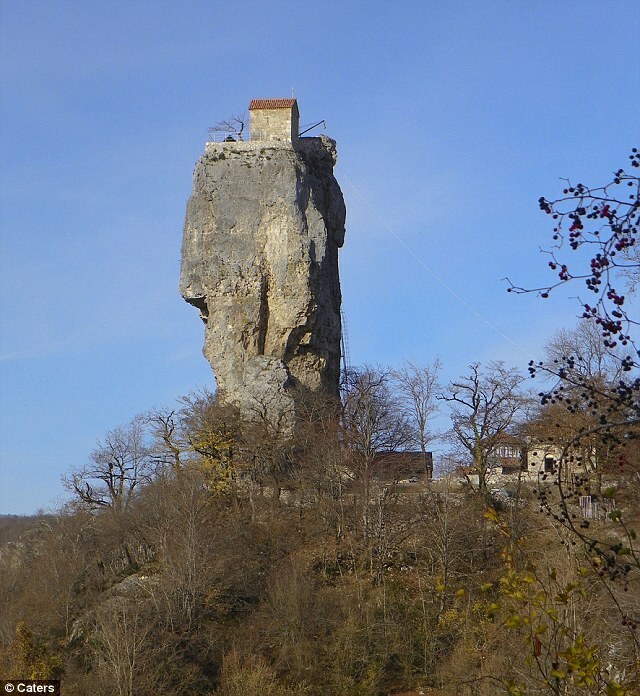 This is the church where religious leaders really are preaching from on high – perched 130ft on top of a pillar of rock. The tiny church sits precariously on top of the jagged cliff that has been eroded by weather over almost 14 centuries. It is believed that Pagans built the temple in the bizarre location as the pillar was thought to symbolise their god of fertility. But experts believe the building near the Georgian city of Chiatura was constructed on the mountain between the sixth and eight centuries. Konstantin Murtkhveladze, 25, braved the perilous ascent up the pillar through a rusty ladder to take these pictures. ‘The old ladder on the side of the pillar looks like it could snap at any time’, he told the Daily Mirror. Konstantin, from Tbilisi in Georgia, added: ‘But once you get up there it sends a chill down your spine. It feels like a very special place. Well I was just thinking, once this lovely building has been restored we could ask Benny Hinn to come and do a ‘holy ghost revival service’ in it. Only of course no blowing on people or knocking people over and -by all means no getting drunk in the spirit stuff!